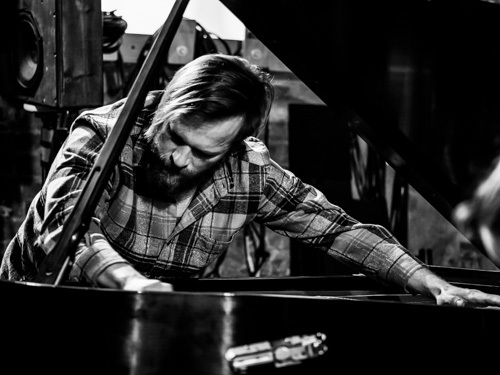 Since pianist and composer Eli Wallace moved to Brooklyn in 2015, he has been a steadily growing presence on the music scene. On March 1, he released his debut solo record, Barriers, and I had the opportunity to speak with him about his work. Cisco Bradley: You just released a solo piano record, Barriers. Has that been a goal for a long time? How did you go about conceptualizing the record? Did you have to do anything to escape the history of solo piano records looking over your shoulder? Eli Wallace: Wow, okay this is a terrifically loaded question so here goes: Yes! I just released a solo record, and a huge weight is lifted from my shoulders. Releasing a solo album has been an objective for quite some time, really from the year I graduated NEC in 2011. Playing solo was what freed me musically, allowing me to create the music I was hearing and envisioning. I was taking a class at NEC with Ran Blake and he heard my solo stuff and encouraged me to do more with it. So I did. I composed shorter solo piano compositions and longer pieces, one based on an extended row (more than twelve tones) of pitches combined with rhythms. I wanted to record these pieces for a solo album but it never materialized for various reasons. Thereafter, my solo piano approach began to change as I would intersperse my compositions with completely improvised pieces during a set. Finally, I abandoned the compositions and just improvised. I found that I was able to compose an extended piece in real time during my improvised solo piano concerts, solidifying and affirming my approach – most notably with a couple performances at Maybeck Studio in Berkeley, CA. Performing solo is probably my favorite format as I feel I’m able to utilize my compositional predilections and experience, with my capricious improvisational temperament. I prepare and conceptualize differently while playing, often thinking ahead and planning different sections or transitions carefully. I also realized that my best results playing improvised solo piano occurred in front of an audience. So, for my solo record, Barriers, this was the concept: a live recording of an uninterrupted improvised piece in front of an audience. I was offered to play a live concert and it was at a venue that records shows. So, I went into the show hoping that I would create a piece that I would want to release, and that’s what happened. In my practicing I was working on many new techniques with piano preparation and playing inside the piano. I had a blast employing some of these new devices and sounds in this concert. During the concert I was very concerned with contrast, specific use of space as it relates to silence or sustain, and varying length of phrases and ideas. I also wanted to layer and overlap multiple sounds/ideas so that transitions could occur where a sound that was previously in the background was able to emerge to the fore. Lastly, I was interested in combining traditional playing with sounds coming from inside the instrument simultaneously. Did I have to do anything to escape the history of solo piano records looking over my shoulder? Um, yeah definitely, haha! When I’m performing and when I performed this piece I just try to be present; taking long walks right before solo piano concerts helps a lot. I think the long history of solo piano records is one of the reasons it was daunting to release one myself, and why I put it off for so long. But in the end comparing my own work to that of such favorites as “Silent Tongues” by Cecil Taylor, or “Payan” by Alexander von Schlippenbach doesn’t do me any good; all I can do is concentrate on my own playing. Now that this release is out, I can’t wait to start working on a new solo piano album that’s more pre-planned and recorded in the studio. Barriers is available for streaming and purchase here. CB: Cataclysmic Commentary’s release Audience Participation, was on my list of best records of 2018. This seems like a band with a lot to say. What are the narratives behind the music? How does that band collaborate to make music? EW: First of all, I’m very grateful that you included our album Audience Participation in your list of best records of 2018. Ben Cohen, Dave Miller, and I were thrilled that we made that list. We were honored to be included with such great company as well, so thank you very much! Yeah, this band does have a lot to say, so I’m glad you picked up on that. Cataclysmic Commentary was spawned with a desire to comment on socio-political narratives, dynamics, and perspectives. We purposefully integrate these ideas into our work through the compositions that we choose to perform, and how we approach each set or performance. None of our sets are just randomly improvised. We always discuss and hash out our approach to each one, establishing a plan ahead of time. However, these outlines can differ. Many of our initial sets were comprised of different compositions by all three of us, pieces from other composers, and interpretations of folk music that directly addressed a certain issue or topic on which we wanted to comment. Before another set we wrote down a long list of potential titles and then played short improvisations based on titles selected from that list. Our album was sculpted in a similar fashion. We asked friends and family to submit potential titles for improvised pieces. We then culled from that list, selecting choice titles on which we wanted to comment musically. Then, we performed improvisations based on those titles. Finally, we selected the strongest tracks for the album, hence the name Audience Participation. Lately, we’ve worked on group improvisational dynamics, gaining more comfort with each other through exercises in musical entrances and exits, letting one player flush out an idea before joining, using space and silence in different ways, interacting with pulse and rhythm in various relations, etc. Dialogue is essential for this band, and even when a set or a title may not have a direct political or societal implication, we are often responding implicitly to certain current events or sentiments as discussed beforehand. Our discussions and how they relate to the music are one of the things I love about playing with Ben and Dave, and without them this band wouldn’t be what it is. Lately, we’ve all been busy with other projects but I hope to get back to work soon! CB: How did you get on the path to becoming a musician? EW: I came from a very artistic household in that arts came first in many ways. So, I was playing piano from a very early age; music was just something all of us (my two siblings and I) did. I began piano with a teacher who taught from a method book and I disliked it. So, I quit and then started again later with a teacher that just taught me how to play boogie and blues progressions by ear right from the first lesson. I was hooked! Reading music came naturally later after learning lots of pieces by ear and just picking things up from my teacher. His name is William Beatty, and I’d say he’s one of the most influential people in my life. Then I got hooked on jazz when I heard “Compared to What” from the album “Swiss Movement” by Les McCann and Eddie Harris. Thereafter, I learned all the good stuff like Thelonious Monk, Charlie Parker, etc. as well as learning a lot of classical repertoire like Debussy and Beethoven. When I was a Senior in High School I decided I wanted to try to get into conservatories, although I hadn’t really committed to music yet as my career or job. I got into the Conservatory at Lawrence University as a Piano Performance major. When I got to college all I wanted to do was practice, and that’s pretty much what I did. My friends and I would often get kicked out of the practice rooms at school late at night, either practicing individually or playing tunes or just improvising. I knew then that I was going to be a musician. CB: What do you consider to be your greatest influences as an artist? Musician? Improviser? Composer? EW: This is a tough question as I’d say it’s changed quite a lot over the years and there are always certain influences that dominate specific artistic periods and then fade away during others. As an artist I’m constantly oscillating between my desire to compose versus my desire to play and perform. Currently, I’ve radically changed my improvisational approach to the piano during the past year. So, by necessity I had to listen to other pianists. Augusti Fernandez, Irene Aranda, Denman Maroney, and Eva Risser are four pianists who have helped me sculpt my approach over the past year. Previously, pianists such as Cecil Taylor and Alexander von Schlippenbach were very influential on me in terms of a pianistic perspective. However, there are two albums that permanently changed the course of my artistic direction. When I was attending New England Conservatory I felt stuck. Being a jazz composer and pianist was my identity, but it didn’t feel right. I felt there was music I wanted to write and play that I couldn’t achieve with this idiom. I went into deep compositional hole, listening to a bunch of music and studying scores. I discovered “Unit Structures” by Cecil Taylor and “For Alto” by Anthony Braxton. As a composer and a performer these albums continue to inform the way I conceive music: contrast in density, contrast in sound, layers of composition, constructing musical ideas, achieving improvisation within notated structures, etc. As an improviser Braxton is often thinking like a composer, and that’s something I wish to carry into my own improvisational work, particularly when I play solo piano. Lately, Toru Takemitsu inspires me for his interest in noise in relation to the traditional classical composition canon. I’ve found his ideas creep into my composing and my piano playing, using sympathetic vibration and other techniques to generate layers of sound coming out of the piano simultaneously. There are so many other influences I could cite that have informed my work as a composer and separately as an improviser but we’d be here all day. So, I’ll end with saying that recently the sculpture of Ursula von Rydingsvard is my current primary inspiration. The way she constructs her art is sympathetic with how I view music both sonically and in terms of score presentation. Many of the graphic scores I’ve composed were directly influenced by her work. Visually I often see music not as colors like Scriabin or Kandinsky, but as shapes that differ depending on the sound. Her shapes are very similar to how I see/hear sound in my head. CB: Who have been your primary collaborators since moving to New York City? EW: There were a few people who were my primary contacts and introductions to the scene in NYC when I arrived and they’re still my primary collaborators. Deric Dickens is a drummer I met immediately and we’ve been playing ever since; our musical sensibilities have changed quite a bit since our first musical interactions. We have a new trio with Erica Dicker and I hope we do more with that group! I’ve played quite a lot with Aaron Quinn and my friend Dave Miller, who I knew before moving to NYC. However, most of my musical world revolves around Ben Cohen, who I also met right after I moved to Brooklyn in the Fall of 2015. He had an open room and he invited me to move in with him in his apartment in Kensington. Then we moved together to a house in East New York. So, we collaborate constantly – people will often ask us to play in groups together, and we play sessions at our house all the time. We just recorded a duo album and I’m really excited for that to come out hopefully later this year. We have both pushed each other to move in new directions in terms of the sounds that we’re able to produce on our instruments, the improvisation strategies we’re able to employ, and the boundaries we’re able to push collectively and individually. He’s also just a fantastic human and one of my favorite people. Additionally, I’ve collaborated here and there with musicians such as Carlo Costa, Sean Ali, Angela Morris, Kevin Shea, Sandy Ewen, Daniel Carter, Andrew Smiley, Joe Moffett, Dan Kurfirst, and others. Lastly, I’ve been playing quite a lot with Drew Wesely. We have an ongoing duo project and play in other configurations as well. I still feel like a newcomer in NYC and there are so many musicians that I’d either like to play with more, or play with for the first time. I’m still humbled and in awe of the wealth of musicians in this area. CB: How has your sound changed since moving to New York? EW: Wow, this scene has completely pushed me in new directions for many different reasons. I guess, I’d like to start with my hand injury. It’s something I’m still uncomfortable discussing but has actually had a very big influence on my playing. While biking I got doored and fractured the middle finger in my right hand within the first year that I was here. It healed, but it’s never been the same. After being frustrated for a while I adapted. I used to play a lot more notes and create more sustained activity. Sometimes I still do that but it’s not my preference due to my physical limitations and my development as a musician. Now I spend more time listening, more time engaging in space and silence, more time exploring different sounds, creating walls of textures, and in fact I prefer the results. I played with a drummer in California who is still very dear to me but he pushed my playing in this insane energy direction. It was great at the time, but due to my finger injury and my own exhaustion with that playing style I’ve changed. I still like to have a high level of focus and intensity while I play, as I think it’s a defining characteristic of my approach. However I prefer to channel that intensity in other directions: trying to be very clear and aware about what I’m playing and my role in the improvisation, leaving space, interacting with silence, using different sounds and textures from the piano, allowing improvisations to grow without forcing anything, being patient. Not that I didn’t consider these things before, they’ve just become much more important in my practice as an improviser. I’ve also delved into a lot of noise music over the past two years such as Richard Ramirez, The Incapacitants, C.C.C.C., Merzbow etc. Being on the New York scene I’ve heard how improvisers incorporate this aesthetic into their own playing and I’ve been heavily inspired by it. Thus, whereas before I might bring an E-bow and a couple of timpani mallets or drumsticks to a gig to play inside the piano, now I bring an entire backpack of objects to a gig. The piano is an amazing instrument in terms of the sounds that you can generate and in my own practice I’m incessantly exploring new ways to play inside and prepare the piano to coax new, interesting, pleasing, and disgusting sounds out of the instrument. This development has all taken place since being immersed in the NYC scene. CB: What three things would most improve the music scene in New York? EW: First, I think we can all support each other a lot more, myself included. When I first moved here I went out to shows at least four times a week. I tried to go and see as many players as I could to get a feel for this scene and what people were up to. I was shocked to go and hear some of my favorite players perform to a room of 1-2 people. To be part of a community everyone needs to participate. That includes going to see shows. Not just shows that will inevitably draw due to big names, but shows of musicians we’ve never heard, younger players, musicians that haven’t gotten wider recognition yet. I think I got burnt out of going to shows all of time and I don’t go as much as I should, so currently I need to work on this more too. Second, following up on the first point I think there’s often too much going on. There have been so many nights when I’ve had a show and I see who else is playing that night and I get overwhelmed. Nightly there are so many options and it depletes the audience for all of the shows. I don’t really know a way around this, as I think it’s inspiring that everyone is playing a lot of shows and that there’s so much going on every night. However, it can be exhausting too when you hustle to put on shows and only a few people attend. Therefore, I think more shows that bring together a larger portion of the community could be a good thing, or discussion and coordination between different bookers/curators. Third, I think there could be other opportunities for community building and engagement. I don’t really know what this would look like, and I don’t think I’ve been here long enough to spearhead anything like this but casual improvisation workshops or session concerts might be a fun idea to bring people together. In California, these existed and it allowed people to be exposed to musicians in different niche scenes. In NYC I’ve found that there are some heavily defined musical cliques. There’s nothing inherently wrong with this, it creates strong friendships and thus strong musical partnerships which are a positive thing. But, sometimes I wish there was more openness to a bigger variety of musicians on certain bills. Again, this goes for myself as well: too often I’m quick to ask my friends to play on shows rather than asking someone else that I don’t know as well. CB: What was your vision for the Outskirts Piano Series? What music in particular have you been presenting that was not otherwise represented? EW: To be clear, Outskirts Music Series is Ben Cohen’s curation. He’s put on house shows for years (Kensington Improvisers Collective). When we moved to East New York, he changed the name to Outskirts. I’ve been curating the Outskirts Piano Series, which is basically just still house shows at our place, but with a piano focus. My goal is to put on four of these a year. There are a few series that have popped up lately centered around a specific instrument and I thought it’d be fun to do one with piano, especially since we have a space with a grand piano. I was playing a gig once and the piano had a sign on it that specifically instructed people to NOT play inside the piano. While I understood where the venue was coming from, it irked me immensely and underscored the whole closed-off vibe that some places have. So, I wanted to create a series with a completely open approach for pianists to do whatever they want to do on the instrument, creating a supportive and exploratory environment. Therefore, I started a series where it’s pianists only (unless they want to collaborate with others for their set) and they can do whatever they want to the piano – as long as no one really messes it up. The series is all about providing a place for pianists working in a variety of genres to be able to try out and present whatever they want. So far, classical pianists, improvisers, composers, jazz pianists, and sound installation artists have been booked. I’m thrilled at the variety of pianists that this series is able to showcase. I was worried it’d be too much piano, but for every concert, it has been fascinating to hear the differences and similarities between the approaches of all of these pianists. The next one is May 5 with Bob Bellerue, Matt Mottel, and Jessica Pavone. I can’t wait to hear that one myself! Lastly, as pianists we often don’t interact much. We rarely play shows together or collaborate as there are rarely two pianos in one location. So, I want this series to bring pianists together so that we can support one another and get to know each other. The last show was very successful in this as pianists attended as audience members, I hope this continues. CB: What new piano-drum duo dynamics have you been exploring with your project Dialectical Imagination with Rob Pumpelly? EW: This question is tough. After a very productive 3 years that saw the release of three albums and the completion of three tours it’s become increasingly difficult to collaborate living apart. Rob doesn’t live in New York, and it’s just gotten tough to keep up the momentum, so we’ve slowed down a bit. Nonetheless, Dialectical Imagination is Rob’s project and so I’ll discuss his approach a bit because it’s unique. Rob is truly an inspiring fellow. He’s listened to more music than anyone I know and has spent the last ten years writing his own music theories. He’s made some fascinating inventions about how to discuss and delineate music, and I hope that someday these ideas will go to press. His revelations are directly reflected in Dialectical Imagination. He created a system, a musical dialect to which I subscribed. Even though our playing is largely improvised, it’s all planned out using flash cards as guides. We spent rehearsals practicing the different types of improvisational territories outlined in the directives. So, during a performance the music flows between notated sections and the different areas of improvisation fluidly, as outlined. What this creates is assured music with very little uncertainty so that we are free to interact and connect with each other at all times. There’s a reason that Rob coined this music “ecstatic music.” As a performer, it really feels that way when we collaborate together.